The 2017 BC Craft Survey Results are in. In the 5th annual survey we collected survey responses from 1172 consumers. The survey took place over the duration of November 2017 and responses were collected through an online form. The results are a representation of the opinions and preferences of craft beer consumers. This is not meant to be a representation of all BC consumers as there is a significant bias to those that are engaged in craft beer. 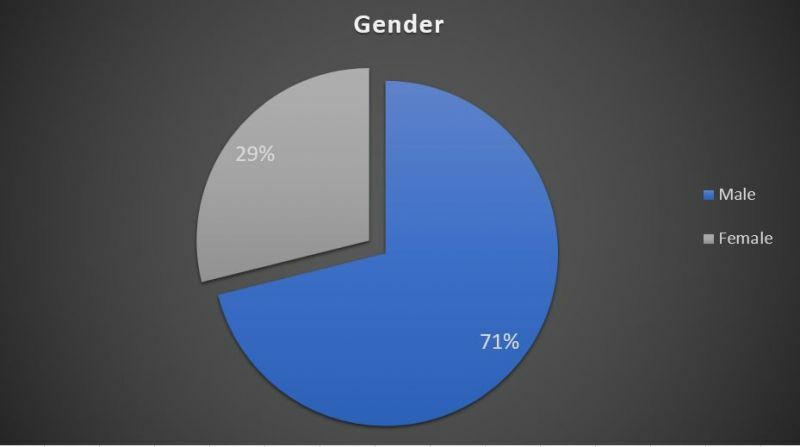 The respondents to the 2017 BC Craft Beer Survey indicated that 29% of craft beer consumers are currently female with 71% male. There were 3 responses (.26%) that did not enter a response. In collecting age data for respondents anyone under the age of 19 was not permitted to complete the survey. The median and mode for the data falls in the 35-42 age category. 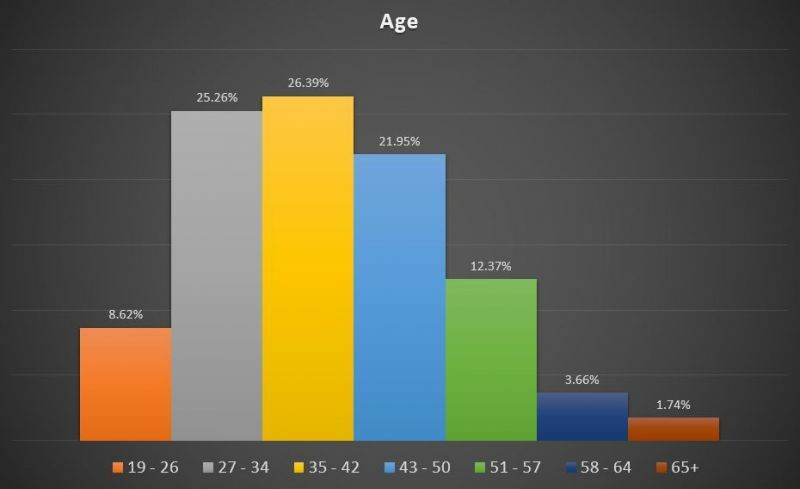 You can also observe that 73.6% of all respondents are between the ages of 27 and 50. 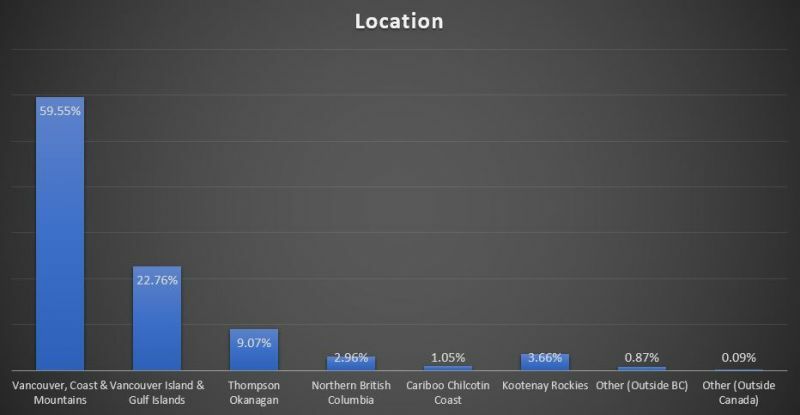 The location of respondents was collected as the BC government breaks down regions of the province. Similar to the population distribution there is a disproportionate number of responses from Vancouver, Coast & Mountains and Vancouver Island & Gulf Islands regions. As a result of this bias, there may be preferences for smaller regions that are not represented by the overall data. When asked how many breweries one had visited in the past 12 months the mean number was 12 with 56% of respondents saying that they have visited more than 10 breweries. Only 2.8% of respondents stated that they had not visited a brewery. When asking about the number of beer events attended in the past 12 months, the mean response was 2.08. The median and mode responses were both one event. Looking at the extremes, 28% of consumers attended no events while 4.9% attended 10 or more. 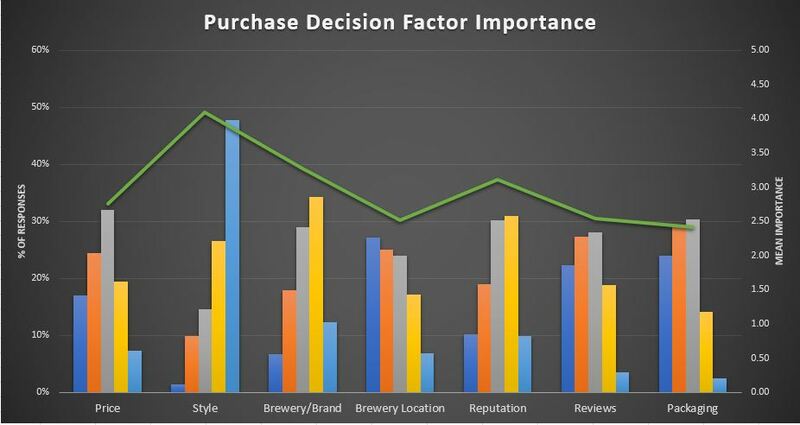 The purchase decision factor is a ranking of how important each element is in purchasing beer. On a scale of one to five respondents were asked to rank each factor listed in the graph below. The most important factor when purchasing beer is Style followed by Brand and Reputation. 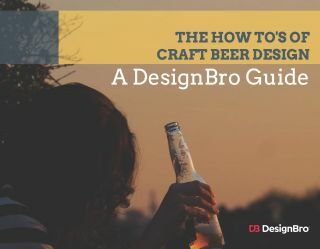 The least important factors in purchasing beer is packaging and brewery location. Also worth noting is while brewery location is not seen as a leading purchase decision factor, it did have the highest standard deviation of responses. That is, there was the greatest range of opinions in this factor. When asked if planning to visit a brewery greater than 100km from their home in the next 12 months, 65.3% of respondents answered yes. This question is meant to be an indication of the tourism impact that craft beer has in British Columbia. 24.1% of survey respondents stated that they have brewed their own beer over the past 12 months. Craft beer consumers appear tp have a preference to purchase beer from Private Liquor Stores, then the brewery, Government Liquor Stores and in a distant 4th place at a bar, pub or restaurant. 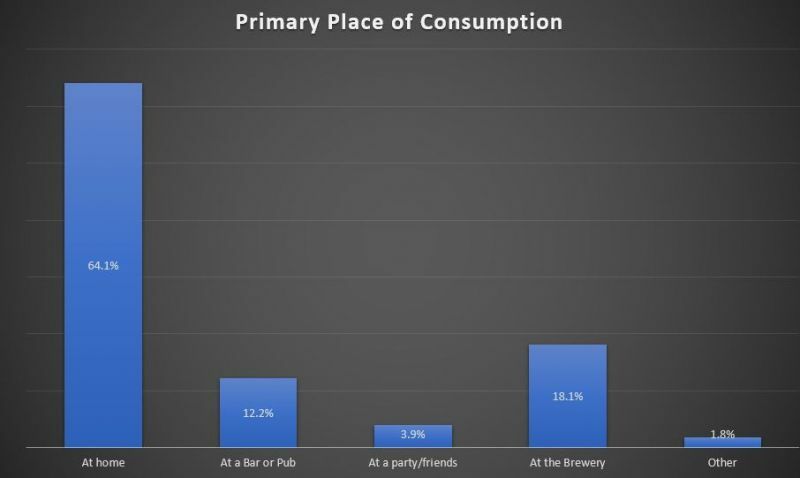 When asked where respondents primary consumed beer, 64.1% stated home, followed by at the brewery with 18.1% of all responses. 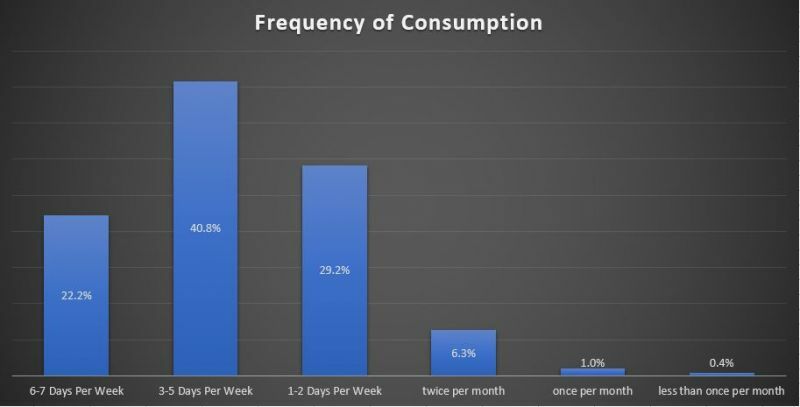 The mean, median and mode response for how often beer is consumed from survey respondents is 3-5 days per week with 92% of all respondents indicating that they drink beer at least once per week. 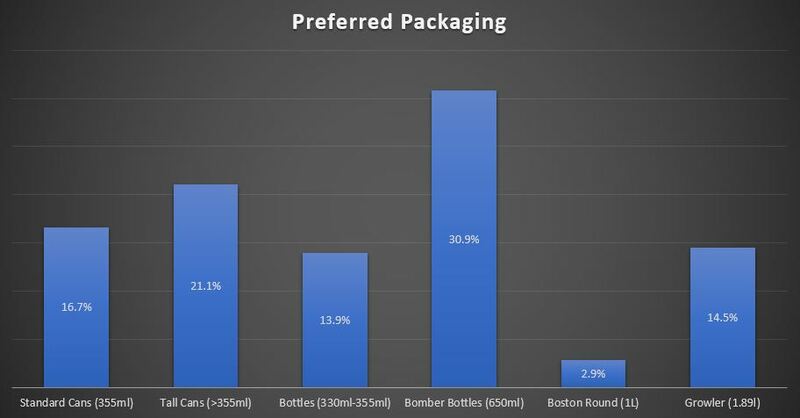 When asked what packaging format respondents preferred to purchase beer, 650ml bottles are the leading format at 30.9%. The second preference was stated to be tall cans >350ml. This is a drastic shift from previous years data with tall cans leaping ahead of standard cans, single-serve bottles and growlers. When asked about the concept of beer sales in grocery stores, 77.2% of responses indicated support for grocery stores to be able to sell beer. 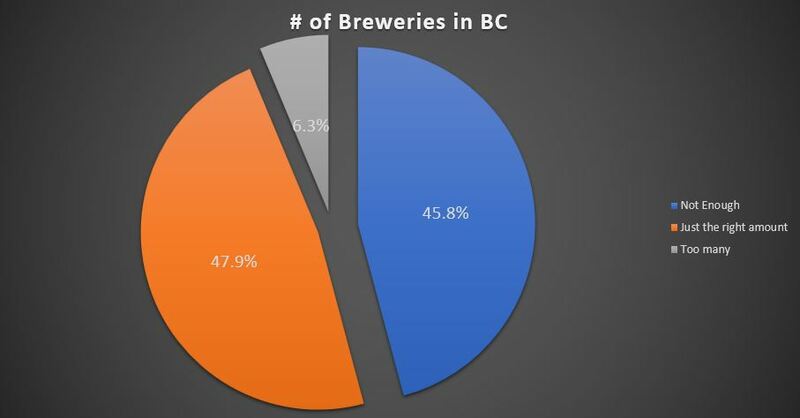 When asked about how consumers felt about the number of craft breweries currently operating in BC 6.3% said that there were too many, 45.8% said there were not enough while the remainder was content with the current quantity of breweries. Finally, we asked respondants what there favourite style of beer was. This question was open ended as to not sway results. Because of this the styles my not fit standard classification and can have some redundancy. By a wide margin, once again the IPA is the preferred style of BC craft beer consumers with Stout, Sour, Pale and Saison rounding out the top 5 responses. Stay tuned for parts 2 & 3 from the 2017 BC Craft Beer Survey which will include trends in data over the past 5 years and the People’s Choice Awards for top breweries, beers, events and more. Do you agree with these results? Leave your comments below. thank you for doing this (again). I’m wondering if you could somehow do an annual comparison for some of it (for example you said that there was a drastic shift in packaging format from last year. It would be interesting to see how the craft beer world is evolving. thanks! 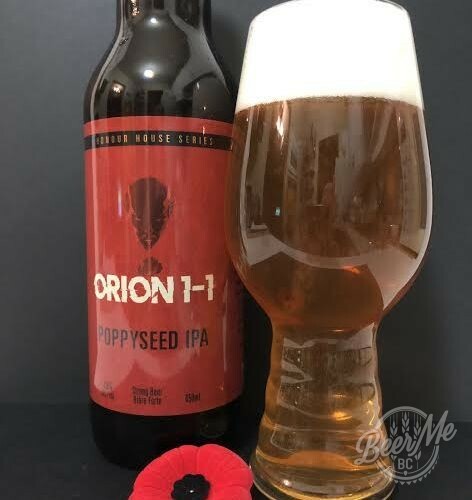 I am law and business student in Toronto conducting research on the BC craft beer market. I wanted to know if you could provide me with the actual data (e.g. In a word or excel file) pertaining to the “purchase decision factor importance” chart. 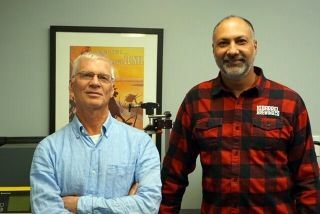 I can be reached at jasonjoseph@osgoode.yorku.ca and I greatly appreciate any help you can offer me!